Cream being as expensive as it is, for this recipe I suggest finding a wholesale outlet that will allow the purchase of a ½ gallon of heavy or manufacturing cream. ½ gallon heavy or manufactures cream. 1. 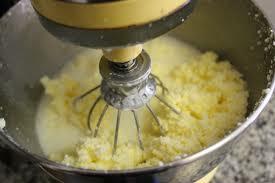 In an electric mixer whip the cream on medium speed until it turns to whipped cream. Soft peaks become hard peaks, and as mountains do these crumble into into soft cottage-cheese-like curds as beads of butterfat. The butterfat will stiffen and clump together and watery milk pools in the bottom of the bowl. This should take about 10 minutes. 2. Pour off as much milk as possible and refrigerate, it can be used for cooking, baking, and drinking. 3. Washing; Use a rubber or stiff metal spatula to press the butter to squeeze out as much of the liquid as possible. This is done to remove as much of the milk as possible to prevent the butter from spoiling. Add 1/2 cup ice water to the butter and use the spatula to press the butter and water against the side of the bowl. Repeat this step as many times as necessary, until the the butter liquid becomes less cloudy. 4. Kneed the butter against the side of the bowl until all the liquid has been pressed out. Sprinkle with salt, if desired. 5. Pack the butter in containers, wrap tightly, and cover.